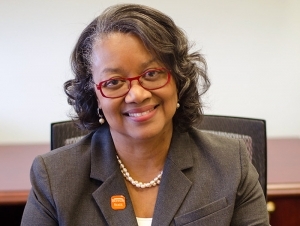 The Coalition of Urban and Metropolitan Universities (CUMU) has announced that Buffalo State President Katherine Conway-Turner has joined CUMU’s executive committee as a member-at-large. CUMU is an international affiliate organization of more than 80 colleges and universities in large metropolitan areas that share common understandings of their institutional missions and values. CUMU was formed in 1989 by leaders of metropolitan and urban institutions who realized their unique challenges and opportunities as they looked to the future of higher education. As president of SUNY’s largest and only comprehensive college located in an urban setting, Conway-Turner oversees and manages more than 1,500 faculty, staff, and administrators who provide more than 200 academic degree and certificate programs to 8,500 undergraduate and 1,000 graduate students each year. President Conway-Turner’s vision for Buffalo State to become “Buffalo’s College” through engagement, excellence, and social responsibility has been embraced and is paying off in dividends for both the college and the community. Conway-Turner fills a seat left vacant by Vicky Carwein, who retired as chancellor of Indiana University-Purdue University Fort Wayne at the end of 2017. She joins 12 other presidents and chancellors of member institutions who make up the executive committee.